← Excuse Me, May I Have your Attention, Please? 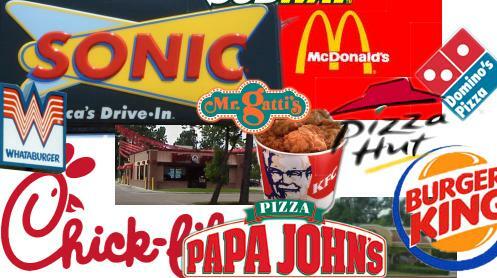 The United States is known for its many low-cost (inexpensive, cheap) restaurants called fast food restaurants. The idea is that you can get your food within a few minutes after you order it. The most common food is hamburgers at restaurants such as McDonald’s and Burger King, although tacos are now becoming popular at restaurants such as Taco Bell and others. Unfortunately, much of this food is unhealthy and is probably one reason why so many Americans are obese (seriously overweight). With the declining economy, my guess is that some of these numbers will go down in the United States as people look for less expensive ways of eating. I would say that I am probably about the same as the average American, perhaps eating out (eating at a restaurant) a little bit more than the average. I have a good reason, however: I am a terrible cook. I’m the same as the average Italian! Maybe a little bit less than the average, even if I’m a good cook! My favorite dish? Pizza , obviously! outside home, and how many food I can buy at the super or shops for the money I spend in a restaurant. Paris, three or four days later, was D´Orsay and we visit also the restaurant inside it and was amazing and quite different from the McDonals. But, there is not money to eat in those restaurants every day in Paris, of course, so being in McD., we saved enough to go to the other instead. Only when we traveled we went to eat in typical restaurants and enjoyed it very much. To see the lands, cities, and drink different wine and eat food from that country we are seing is a good way to understand people who live there. We do that always when visitting differents cities in Spain, and other countries in Europe and it was marvellous. But I don’t see what is the point of going to a fast food restaurant in your own city, only if you can’t go home to the meals it should be necessary doing that if you want to save money. don’t working too much cooking excelent meals at home?. Tell us the truth. complicate dishes and your wife is willing to tell you how wonderful cook you are. Eat less junk food and stay fit. I really had no idea that japanese and american people have ate out that much…wow…..I live in Brasil, and I usually eat out four or five times a year, I believe that brasilian people don´t eat out more than 20 times a year , in average……anyway, I´m not a good cook too, my daughter is aways complaining about the meal when I cook….. In fact, american People usually eat a large fat and caloric amount of food in the fast food restaurants; perhaps even the tradicional restaurants where they usually have their dairy meals such as lunchs and dinners are in fact unhealthy, cause they don`t order only salads. Besides every single salad there`ll be a bunch of fries, or greater fat beef or even more, now with that current economic situation of the country; the tradicional restaurants onners have been trying figure out low-cost menu inn order to get people more interesting go out and have their meals by horizont of options paying inexpressive bills comparing what they are eating. Althougth, I think it is very difficult american people change their habits about eating, because the most which are yonger people don`t seem so interesting to exchange the delicious hamburguers over the not always hummy and healthy foods. After a few years listened to you, whilst I’m going for a run or quietly at home, I consider myself I have become almost a member of your close group of relatives. Firstly, I would like to congratulate all your teamwork. I think you are doing a great job to manage to teach many people for all over the world can learn how to understand and speak English as a second language. On the other hand, I don’t think Americans eat more fast food than other people, even though American restaurants, at least in New York, are almost always packed. Maybe going to eat out is a key factor of current times practically in all developed countries. By the way, I want to ask a question, Why is so dificult at American restaurants to drink a beer to have lunch? I am not an alcoholic one, but just a few of them serve some beers and it’s a strange thing for me. I think that is not necessary to be a good cook to make some dishes or meals enough acceptable. For example, there are many kinds of salad you can make easily, and there, in the beautiful L.A. , California, where the climate is good, they always are appetizing. And, what about the food can you cook in the oven?. Chicken, turkey, lamb, beef, veal, pork, well, all of meat and all of fishes. Cooking oven is very easy and very tasty. It is even easier cook on the griddle the same food. By the way, there is a saying in my community, called “Comunidad Valenciana” (where we speak Valenciano language, besides Spanish language), belonging to Spain, that it says: “The ill has a good excuse, he pisses however he says that he sweats”. No offend, Jeff. It is just a joke. Cooking at home is fun, and eating at home is better than do it out. But, from time to time, could be pleasant go out to eat to a good restaurant, and only we must eat at Fast Food when we have no choice. Yes i love a lot american food, it’s good and tasty, and who [cares] if it’s unhealthy! My preferred fast food restaurants are Bob Evans and Texas Roadhouse. Hello,Jeff. I’m japanese who, you pointed out, spend a lot of time eating outside. I have never imagined that we eat at restaurant much more times than people in the United state of America. In case of my family, both I and my wife work every day. There are a few times when we can’t afford to make dinner in a week. So we somtimes can’t avoid eating at the restaurant which serves us meal with low-cost. The problem is not that that food is low cost, but that it’s absolutely uneatable. Such untasty and unnatural food as I saw in America I hadn’t seen anywhere else in the world and will probably never see (almost sure). In Europe food may be fast, but it really IS food, when American food isn’t actually food, but rather some kind of matter. I don’t know how expensive in american restaurant and whether they have enough time to cook. I guess the reason why guys in other countries like China offen eat at home is that, they have enough time and they want to enjoy the process of cooking. Additionally, eating outside is more expensive. I usually eat lunch outside of my office on weekday, and two times eat & drink out dinner with my colleague at Izakaya, Japanease traditional drink bar, on weekday, and one time eat out dinner with my family on weekdend, so, I usually eat out eight times a week. 8 times multiplied by 50 weeks per year is 400 times at out per year. I think many of Japanese business man who live in the city erea or work in the city like me eat out a lot. So, I might be an avarage Japanese for eating out in Tokyo or Yokohama. I am now living in the neighborhood of the beautiful city of Los Angeles. Since I have kids, my average of eating out has reduced substantially. Before having kids, I ate at a restaurant at least once per week. It was time to share something with friends or colleagues. Sometimes, I just wanted to spend some enjoyable time with my husband. Food was important but it wasn’t my main priority. I liked to talk eating some food and drinking a good wine. I have taken many important decisions of my life eating in a restaurant. After having kids, things change a lot. I know, I can always hire a baby sitter but it is much expensive and I don’t feel comfortable. Anyway, I’ve started to cook some delicious dishes at home. Hi there, according to an article I read recently , the amount of sales on Fast food will increase in this turbulent period we live in. That’s because it’s cheeper than eat on your own house, so restaurants such MacDonnalds are going open new branches . Well,I once spent three month in my brother-in-law’s small restaurant washing dishes and I learnt a lot about cooking .Now working in a company,from Monday to Friday ,we can have meals in our canteen.However ,in the weekends ,I can cook by myself .It is really a grear fun!